I didn't bring a lot home from the library this week, which in a way is quite lucky seeing as I didn't get many library books read either! I am getting right up near the maximum number of books out again. I just can't seem to help myself. Outback by Aaron Fletcher - This is going to be the first group read at the Sweeping Sagas group at Goodreads. It sounds exactly like a book that I will love! 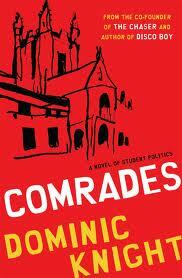 Comrades by Dominic Knight - This is the second novel from an Australian comedian.I liked the first book, so hopefully this one will be as good. A Conspiracy of Kings by Megan Whalen Turner - Feels like I have been waiting ages for this last book in the Thief series. This is a brand new book, so it is especially nice to get that new book feeling without the new book price. Claire should be hosting Library Loot this week, but she is not feeling well, so I am doing it instead! Hope you feel better soon Claire. Just got my membership for Yarra Plenty Library so have looted two books fro there. OH, that's on my list of things to do still! Hey, Marg! I'm Looting from the tropics. There is an awesome secondhand bookstore here in Darwin, although the second floor isn't air con and it's like Hades sometimes. The tropics also make a lot of books yellow. Anyway, hopefully I'll Loot the Library a little more for the rest of the year. I'll be waiting to see what The Outback is like, of course! A Conspiracy of Kings looks good! I am looking forward to reading Outback. I don't know much about OZ history so this should be a lot of fun. Outback looks wonderful and like a book that I would really like. I am headed over to Amazon right now to read more about it. Also, I have had The Thief on my stack for the longest time after reading Aarti's wonderful thoughts on it and I am dying to start that series! I hope you enjoy the last book and I am looking forward to hearing what you have to say about it! Great books there! oh i have GOT to start reading the Theif series! and im right there with you on loving getting brand new releases from the library! i got the newest Bill Bryson hardcover in my loot this week! I've only read the first book in The Thief series and it was a while ago. I can't wait to read the whole thing... perhaps I'll make a weekend of it and read the series straight through starting from the first book again! All of these books look like good reads! I haven't heard of the Thief series, but the book cover has peeked my interest. While I LOVED the thief serise, with this last book, I wished the story involved my fav characters a bit more. Let us know your opinion of the Dom Knight book- I still haven't got around to reading Disco Boy yet! Good loot. Reminds me that I have to put A Conspiracy of Kings on hold at the library! Your post reminds me that I never did complete the Thief series! I think I only read the first two. Will have to check out the rest. Looks like some good books. Outback sounds pretty good - I like a good saga. Oh I've heard great things about the Theif series! It's definitely on my radar! This week at the library I got MIRROR, MIRROR by Gregory Maguire (which I couldn't get into AT ALL! ), and The Historian by Elizabeth Kostova on audio. I've been really enjoying that one - I have it in print and have been going back and forth. It's interesting to compare the physical read with the audio.